hingeback watch for some time now, and have never been happy with the hands as they had remnants of luminous material which looked untidy. Fellow TZner Rob B had recently obtained a bottle of luminous paint produced locally in Western Australia. The paint was originally intended to be used on luminous signs, such as exits, etc, but is now sold at a watch supply house as suitable for clock & watch hands. It is a water-based acrylic varnish containing the luminous material. peg wood is perfect for cleaning out the hands without marring them. peg wood holder can also be held upright in a blob of rodico, a clothes peg, a hole in the desk, etc, whilst the luminous paint is drying. Note that the back side (underneath) of the hand is positioned to the top as this is the side to which the luminous paint is applied. 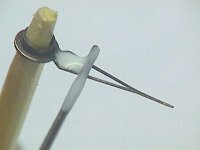 This series of pics illustrates the method of application. The applicator, in this instance a large watch oiler, is loaded with paint and then, in a smooth motion, is drawn across the hand. The paint forms a film across the back of the hand. 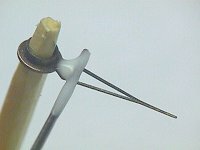 To ensure a complete coverage the tip of the applicator should be kept away from the hand aperture. This particular luminous paint has a very thin consistency and therefore required multiple applications to build up a sufficient thickness. It is important to ensure that there is not too much build up of paint on the underside of the hand as it may interfere with the hand clearance once mounted back on the watch. 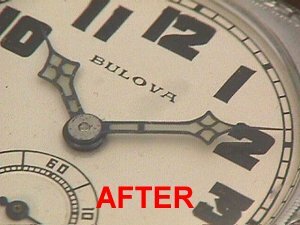 Below are before and after pics of the hands on the Bulova. As can be seen, this paint is a pale green colour, as opposed to the bright green of other available paints. 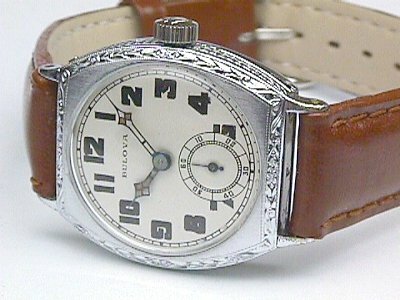 I feel it produces an attractive, subdued look, suitable for vintage watches. The luminous material is light activated, and the glow is reasonably long lasting, and indeed, glows as green as any other in the dark, as the pic below demonstrates. 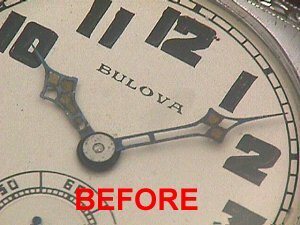 I was pleasantly surprised at how easy it was to restore these watch hands, and to improve the overall look of the watch, with only a modest investment of time. The hands on this Bulova have fairly large openings to fill and caused me no particular problems. 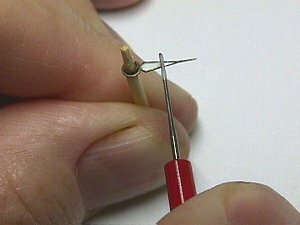 Now that I know how quickly and easily the luminous material can be replaced I would not hesitate to do so on any other watch hands that required it. 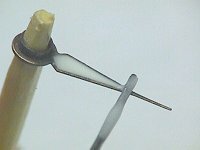 This is an aspect of restoration that needs only minimal tools and is definitely not beyond the capability of many watch collectors.